Help your staff quickly locate and use administrative agency information, rules and regulations. This course explores effective research strategies focused on both print or web resources. Our expert faculty share their secrets and tips, attainable only through years of experience. Audience Level Familiarity with how administrative agencies function and the regulatory and rulemaking processes, or our Understanding the Regulatory Process course. Course Materials Course manual includes over 100 pages of course materials and case studies. Usually requires 1/2 day to 1 day. This program is usually held in Washington, DC. "I primarily lobby Congress and this was useful for those times when it is necessary to find information on rules and agencies." "Speaker gave good hints for being more effective, as well as new resources for info." 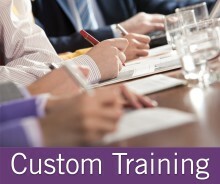 This training program is taught by faculty who have at least 10 years of research experience.